A whistle-blower, Mr. Ahmed Echoda has landed himself in trouble after he allegedly gave wrong information that led the Nigerian Police Force to raid the Abuja home of the Deputy Senate President, Ike Ekweremadu. Echoda, who is 50 years old, was arraigned before an Upper Area Court sitting at the Gudu District of Abuja on Tuesday, and was subsequently remanded in Keffi Prison. Chief Magistrate Umar Kagarko ordered that he should remain in prison custody till June 5 when his bail request will be considered. The defendant is facing a one count charge of criminal conspiracy and giving false information to mislead the police, contrary to section 97(1) and 140 of the Penal Code Law. His trial was endorsed by the Inspector General of Police, Mr. Ibrahim Idris. Police told the court that Echoda's alleged accomplice, identified as Maiwada Adamu, is currently at large. Specifically, the charge against the defendant read: “That you Ahmed Echoda, age 50 of No 44 living truth street Masaka Nassarawa State and one Maiwada Adamu now at large, did conspired within yourselves by informing the office of the IGP at Guzepe Area of FCT Abuja that house no 10 Ganges street Maitama FCT Abuja occupied by Oliver Ogbenyi is being maintained and used for criminal activities including keeping of arms and ammunitions, unfortunately after the police carried out diligence execution of the search warrant no incriminating items were found there. You by such action mislead the police and hereby committed the above offences”. Shortly after the defendant pleaded not guilty to the charge, he sought and secured permission of the court to speak from the sock. Echoda told the court that the Police had yet to establish to him how he passed the alleged false information to them. “They (Police) have not proved that I was the one that passed the said information to them. How did I pass it to them? '', he queried. “They need to tell this court how I blew the whistle for them! I never at any time passed either written or verbal information to the Police”, the defendant insisted. Spirited effort by his lawyer, Mr Peter Ugwuoke to secure his bail after the arraignment proved abortive. Police prosecutor, Mr. David Taiwo, objected to the bail request, maintaining that the offence the defendant committed was not ordinarily a bailable one. He added that the accused person could tamper with police investigations since his alleged accomplice is still on the run. It will be recalled that a Special Squad under the IGP had on May 26, raided the house which belongs to Ekweremadu, following a tip-off from a whistle-blower. 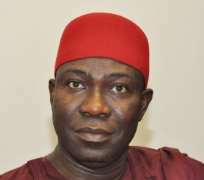 Ekweremadu had in a statement he issued through his Special Adviser on Media, Mr. Uche Anichukwu, condemned the raid which he said was not only conducted without a search warrant, but also a calculated plot to undermine him. The statement revealed that the police search team only met Ekweremadu's steward, Oliver Ogenyi, some staff and their children in the house. “In spite of the fact that they were informed that the property is the guest house of the Deputy President of the Senate, they nevertheless proceeded to thoroughly search the house without establishing any contact with the Deputy President of the Senate or any of his senior staff. The steward was taken away by the police to the Special Anti-Robbery (SARS) Office, Garki, Abuja, where the IGP Special Squad's office is also located. Ogenyi was later released after making a statement. “The Deputy President of the Senate is a law-abiding citizen and does not dispute the fact that the security agencies are empowered by law to carry out searches on premises in accordance with the law. However, the law requires that the owner of the property or his representative must be informed and should be present during the search. “Senator Ekweremadu is worried about the manner in which his guest house was raided. The questions are: Was there a search warrant? What were they looking for? Who searched the police officers before the search? Who supervised the search? “Instructively, this incident comes just a few weeks after Senator Ekweremadu, on May 3, 2017, read to the Senate in plenary a written, but anonymous tip-off by a patriotic Nigerian on a plot to plant incriminating sums of foreign currencies, arms, and ammunitions in a house linked to him under the pretext of the whistleblower policy. The aim, according to the source, was to rubbish, arrest, prosecute, and ultimately remove Senator Ekweremadu from office”, the statement read.